The first time I ever saw Greg Gerding was on the Small Press shelf at Powell’s Bookstore. Being a frugal shopper, I was quite amazed by the immensity of his book, Loser Makes Good, 284 pages to be exact, for $10.00, whereas most books of poetry these days might cross the hundred page threshold and start normally around $15.00. As I flipped through it, testing to see if I wanted to buy his book or a used copy of Rimbaud’s Une Saison En Enfer (A Season in Hell), I was extremely impressed by the transparency of the writer. If he had a soul, which some of his prose poems put that in question, this poet had definitely exposed some of the most charred pieces of it, for each reader individually. Being the avid fan of vulnerability that I am, I decided to have ramen for dinner, and purchase both books, which was a wise choice. When my friend Eirean Bradley, Portland Poetry Slam’s Slam Master, told me that he was opening a poetry showcase, which was also the book release party for Gerding’s latest endeavor, The Idiot Parade, it not only cemented the awesomeness of Eirean, but made me all the more interested in what Gerding was doing. Apparently, University of Hell Press, Gerding’s publishing company, made primarily to publish his own works, was going to publish a long overdue book by Bradley, the I in team. Earlier that same month, Gerding co-featured at the Portland Poetry Slam with Denver poet protégé Ken Arkind. Gerding’s performance, however not run-of-the-mill slam material, was definitely moving. Slam poetry has a tendency to bare all and Gerding did just that. He pulled no punches, leaving himself as open as his writing already does, to the reader. So who are you? What do you do for a living? How do Greg’s bills get paid? What’s the deal with University of Hell? How did you discover poetry and how did that evolve into writing it? “I’ve always been an avid reader, but I was never specifically drawn to poetry, at least not during my earlier experiences. While reading all the “classics” in college, I was turned off by academia and all the inflated language I was force-fed. I’ve always admired “writers” and “writing,” but I never felt I had the aptitude to write in such an inflated way. I just couldn’t relate. I will say though, I have college to thank for leading me to Jeanette Winterson. She has been an ongoing point of inspiration for me. Do you have any creative outlets outside of the literary realm? As a publisher, what do you look for in submissions? What do you look for, that would make something “publish worthy?” What projects are you currently working on, either writing, or publishing, that you are most excited about? 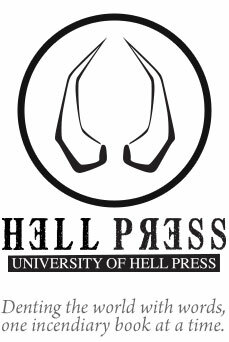 What can we expect from the future of University of Hell Press? And, finally, what advice would you give to aspiring writer and/or publishers, out there reading this? As I search for closing statements, I am sitting on a bus in Albany, NY, heading home to Portland from the National Poetry Slam in Boston, MA. While I was volunteering at NPS2011, I had the opportunity to hear some amazing poetry, to meet some amazing people, and to witness some outlandish activities. Whereas Boston has always felt more like a home for me, even more so than Portland (the town of my origination), I found myself being drawn more and more to the Pacific Northwest. For the first time in my life, I feel more drawn to my roots and less the broad open future; drawn to the comfort of Home. Gerding’s poetry is the family reunion we can never really admit to wanting to go to. Although maybe we have lost connection with our family, our roots, we still love them, warts and all. We sometimes find ourselves missing the sanctity of dinner table political debates, or forcing ourselves to visit our mother, hangover and all. I found solace in Gerding’s sometimes belligerent vulnerability, and continue to get excited by what is yet to come from University of Hell Press. So stop by the bodega, pick up a couple of 40’s, make sure Rites of Spring is in the tape deck, and come over for dinner. It may not be high class, but you will feel, above all else, welcome.